Fabulous South Seas Resort Beach Cottage 1419~ Directly on The Beach! Let the Pictures Tell the Story! World Famous South Seas Plantation, Now Called South Seas Island Resort, Has a History all its Own. 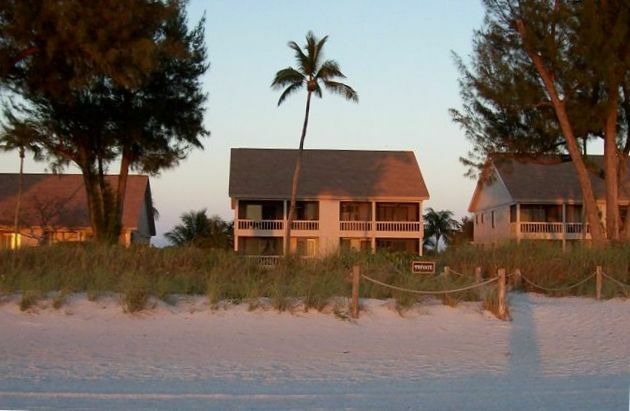 The Village of Captiva Brings You Back to a More Simple Life that is Refreshing and Relaxing. This charming 2 bedroom 2 full bath vacation Cottage is conveniently located on the first level and is easily accessed from the front parking area. It has the luxury of a direct walk to the beach from the screened porch at the Gulf side. Swim in the gulf, build sand castles, fish or just enjoy the warmth of the Florida sun. There is a convenient patio area to wash off sand and sort your shells. Sunsets are spectacular from both the Cottage and the Beach. The master suite includes a king size bed, TV and full bath with tub and shower. The living/family room is enhanced with an entertainment center with TV, DVD player and radio/CD player. The comfortable sofa opens up to a queen size bed. High speed internet is available at no additional charge. The guest suite with twin beds is private with a full guest bath. The laundry room is complete with washer, dryer, iron and ironing board. The Beach Cottage is professionally maintained and kept exceptionally clean. Rent bikes or a golf cart to get around the island where quaint shops and unique restaurants are plentiful. Activities, including wonderful site seeing, fishing and shelling tours are available within walking distance. For your added pleasure, a private tennis court, heated pool and adjacent outdoor grilling are available only to Beach Cottage residents and guests. Come and experience the tranquility of being in one of the most luscious environments in Southwest Florida. This is Paradise at its finest!! Resort amenities are not included in this rental. Cable TV in Living Room, Master Bedroom and Guest Bedroom. The perfect property for the perfect island getaway. My family and I stayed in this property for our very first visit to Captiva. This was a perfect experience made even better by a stay in the perfect property. The cottage itself is exquisite. It's well kept, immaculately clean and only steps from a very private beach. The screened in deck is the perfect place to catch views of some of the most breathtaking sunsets you will ever witness. While the property owners were very gracious and communicative throughout. We will definitely stay here again on any future visits to Captiva. We love having you at the cottage every year. It is always a pleasure to have you as guests. Everything you do to help maintain the cottage during your stay is so appreciated. We look forward to having you back again in 2017. All the Best to you and Happy New Year!! This cottage exceeded our expectations and Captiva was a an awesome vacation getaway. Walking down the length we encountered almost no one. It was like the island was our own. A perfect time to vacation without many people around. Our cottage was the perfect choice. Unbelievably well stocked and supplied and very very clean. The in cottage laundry room was a definite plus everything worked great. We recommend this for the best getaway ever! Kudos to the owner and mangers! We were so glad that this last minute getaway worked out. You were great guests and please come back any time. You left the cottage as if there was never anyone there.....thanks many times over! The beach cottage was a great place for our family of four, including two 7yo, to relax. The accommodations were nice and well kept, and the property managers were great at answering questions. The cottage itself was very clean and provided all you could need. We loved the beautiful beach and loved that so many activities were within walking distance. We can't wait to return. We are thrilled that you enjoyed the Beach Cottage and the beach. Keeping the Cottage in excellent condition and clean is extremely important and is what the owner and we as managers strive for. We so appreciate having guests like you and your family who help us maintain our high standards. Thanks for taking such great care of the cottage and hope to have you as guests again soon. This beach cottage was a perfect place to relax and unwind. We brought my son's friend who had only been to Myrtle Beach. When we walked down to our private beach, he said "where is everyone?" I explained it was a private beach and he said "this is awesome, we have it all to ourselves!" And that we did. The cottage was spotless and had everything we needed. Would not have changed a thing. Highly recommend staying here your next vacation. We had a great week! Perfect location- beautiful beach, kayaking, shelling, biking. We were able to eat out with great local restaurants or eat in with grilling fresh fish. Loved it! The owner only accepts checks. No credit cards are accepted. The Security deposit is returned with 7 days of departure assuming no damage or excessive cleaning is required.